Our public classes are held seasonally from late fall until spring in locations throughout northern New England including Montpelier, Burlington, Concord, Portsmouth and Portland. We are also available for onsite classes and private consulting at your location anywhere in the U.S. throughout the year. Our training classes are taught by experienced, NCCER- and NCCCO-certified crane operators who understand the practical realities and challenges of working safely and effectively on crane sites. Using a combination of instructor lectures, participant discussions, videotaped scenarios and hands-on practice, we go beyond the textbook and teach you what you really need to know. If you would like to receive our seasonal newsletter, please click here and type "Newsletter" in the subject line. For past issues of the NECS Newsletter, click here. Jave is New England Crane School's longest-standing client. 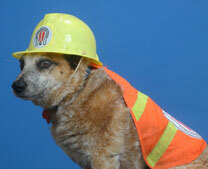 He has been working on his "under 21 tons" certification for three years now, but due to the unfortunate lack of opposable thumbs, he has not yet passed his practical exam. He takes advantage of our policy of allowing exam re-take candidates to attend future classes free of charge, so look for him in the back of the classroom this season.